Happy Mardi Gras, everyone! Traditionally, this was the day when households prepared for the Christian season of Lent (the period from Ash Wednesday until Easter Sunday), which is marked by fasting – and in those days, that meant staying away from everything delicious. Thus, fat Tuesday was the day when you cooked up all the food worth eating in your house and ate them so that it wouldn’t go bad during your month or two of eating crackers and broccoli or whatever. The advent of Protestantism has changed this, since deinstating Xtreme dieting as a religious requirement, and the advent of being gluten-free has also changed this for me, personally. No longer our sweet dalliances, free pancake flips on campus, for I can abide thee no longer! Thankfully I am a modern woman so I’ve moved on, and pretty quickly, too. The gluten-free pancakes and I are very happy together. Not pictured: muffins. The best part about these pancakes is that they are soft and fluffy. 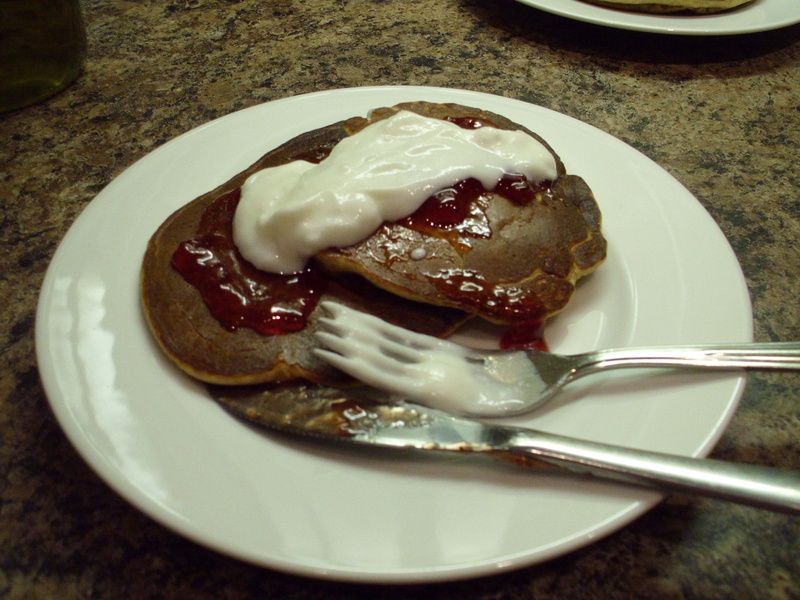 Often gluten-free pancakes are kinda crunchy, or unfortunately chewy in spots. These ones puff right up like regular hotcakes, and are soft to boot. I could go on, but that way lie metaphors worthy of a romance novel, and we don’t need those sorts of associations with pancakes. Unless you like that kind of thing. But then you’re on the wrong blog. 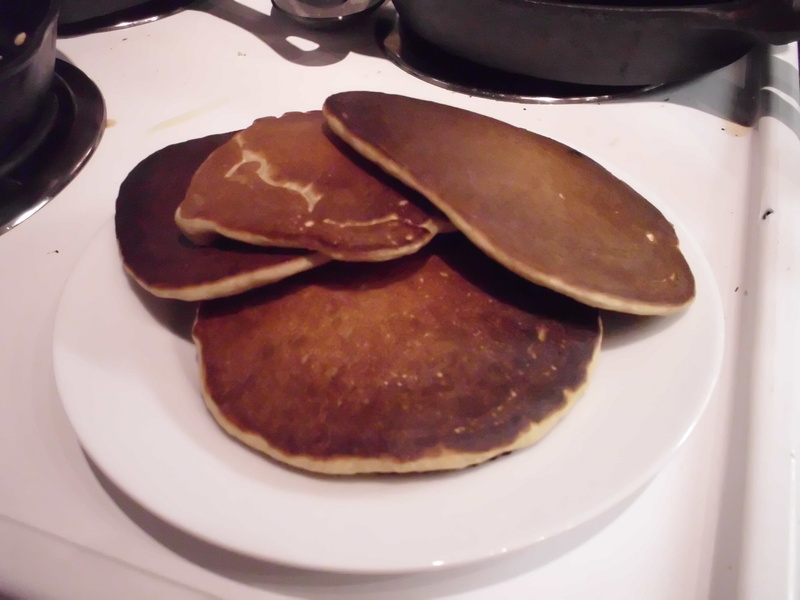 This recipe started as muffins but I like pancakes and was hungry RIGHT NOW so they do double time and are delicious as both; thus, the recipes for both! PS, these are sugar-free, gluten-free, milk-free, and could be soy-free if you wanted to sub in rice milk or almond milk. For pancakes: heat a cast-iron skillet to medium heat, and combine the dry stuff in one bowl, then the wet stuff in another. Ensure that the honey mixes thoroughly with the other wet stuff, then mix ’em both together. For muffins: preheat the oven to 350 F, then do the combo mambo; again, make sure the honey is mixed in thoroughly with the wet ingredients before you put them in with the dry. Grease your muffin tins (or put in paper cups, which I had run out of), and scoop the mix into each. Mix brown sugar and cinnamon in a small cup and sprinkle them on top (if you want to keep this sugar-free, just sprinkle on the cinnamon); chop up an apple and put a slice on top of each. So fancy!